"To challenge my students to think about the ethics of what we owe to people in need, I ask them to imagine that their route to the university takes them past a shallow pond. One morning, I say to them, you notice a child has fallen in and appears to be drowning. To wade in and pull the child out would be easy but it will mean that you get your clothes wet and muddy, and by the time you go home and change you will have missed your first class. I then ask the students: do you have any obligation to rescue the child? Unanimously, the students say they do. The importance of saving a child so far outweighs the cost of getting one’s clothes muddy and missing a class, that they refuse to consider it any kind of excuse for not saving the child. Does it make a difference, I ask, that there are other people walking past the pond who would equally be able to rescue the child but are not doing so? No, the students reply, the fact that others are not doing what they ought to do is no reason why I should not do what I ought to do. Once we are all clear about our obligations to rescue the drowning child in front of us, I ask: would it make any difference if the child were far away, in another country perhaps, but similarly in danger of death, and equally within your means to save, at no great cost – and absolutely no danger – to yourself? Virtually all agree that distance and nationality make no moral difference to the situation. I then point out that we are all in that situation of the person passing the shallow pond: we can all save lives of people, both children and adults, who would otherwise die, and we can do so at a very small cost to us: the cost of a new CD, a shirt or a night out at a restaurant or concert, can mean the difference between life and death to more than one person somewhere in the world – and overseas aid agencies like Oxfam overcome the problem of acting at a distance. At this point the students raise various practical difficulties. Can we be sure that our donation will really get to the people who need it? Doesn’t most aid get swallowed up in administrative costs, or waste, or downright corruption? Isn’t the real problem the growing world population, and is there any point in saving lives until the problem has been solved? These questions can all be answered: but I also point out that even if a substantial proportion of our donations were wasted, the cost to us of making the donation is so small, compared to the benefits that it provides when it, or some of it, does get through to those who need our help, that we would still be saving lives at a small cost to ourselves – even if aid organizations were much less efficient than they actually are. I am always struck by how few students challenge the underlying ethics of the idea that we ought to save the lives of strangers when we can do so at relatively little cost to ourselves." 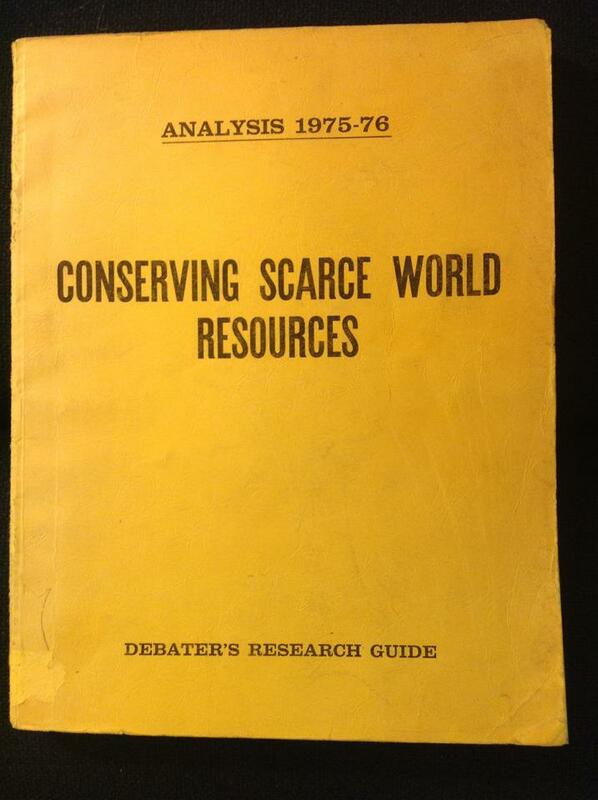 In 1975, the year young Meredith Garmon -- who then went by "Steve" -- turned 16, the national high school debate topic was, "Resolved: That an international organization should control the development and allocation of scarce world resources." Some affirmative teams chose to focus on food. There's enough food in the world for everyone, they argued, so let's set up an international organization to distribute it so that starvation would be eliminated. Some time in the fall of that year his debate coach set Steve up to participate in a "public debate" for the edification and possibly amusement if not amazement of the local Rotary or Lions or some such civic club. This would be different from the usual debate competitions to which Steve was accustomed. For one thing, it was a one-on-one affair as opposed to the two-on-two debates of tournament competitions. Steve would be squaring off against Paul, the classmate who was Steve's partner at said tournament competitions. For a second thing, this audience, unfamiliar with the technical jargon and fast talking of competitive debate would require Paul and Steve to adopt a style that was considerably slower and that spent more words (as well as time) explaining each argument. 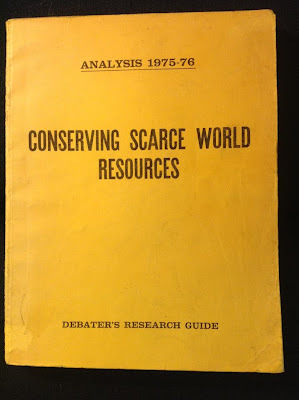 Steve was assigned the affirmative, and, drawing on evidence researched in preparation for the national debate topic that year, he argued that starvation was significant and that, in terms of the quantity of food on Earth, ending it was possible. Therefore, we ought to, indeed, distribute food so as to end starvation. Paul shrewdly countered that this would mean food producers (which included some of the stalwart citizens in the room) would either get less than the market value they were now getting, or that we would have to all be taxed to pay the food producers the market value for their crops. And either way we'll all be taxed to pay for the distribution. Steve thought, and argued, that surely the compelling need of 10,000 premature deaths a day from starvation outweighed these concerns. It was clear to him that we would not begrudge the costs to save our neighbors. The fact that the great mass of the most hungry are overseas doesn't matter, he said. We have obligations to help others when we can. A human life is a human life, and our obligation is not limited only to fellow citizens of the same country as us. A life doesn't stop mattering just because it's on the other side of a national boundary. At the end of the debate, the audience applauded appreciatively. They were not polled as to who they thought won the debate, but somehow Steve had the impression that, had they been polled, he'd have lost. The audience was implicitly patriotic and would have included a number of WWII veterans. Steve suspected that he had not persuaded very many that people far away counted just as much as fellow Americans. Lake Chalice believes that, like the students in Peter Singer's classes, we know that saving a life is saving a life whether it's someone a few yards away or on the side of the globe. Lake Chalice believes that we know that saving a life is the right thing to do even if it causes us some inconvenience and sacrifice. It's just that when the dying person in need is far away and out of sight, it's easy to push out of our minds. Steve Garmon, age 16, clearly understood that lives should be saved wherever on the globe they may be. But, as with most people, time passed and he allowed other matters to command his attention. Lake Chalice is grateful that Peter Singer has been relentless in not letting us push from mind a truth that we know but prefer to live as if we didn't: that neither distance nor nationality are morally relevant. Other philosophy professors have picked up Singer's thought experiment, and pose to their own classes the hypothetical drowning-toddler scenario. The discussion sometimes hits students as a revelation. The revelation is not that all lives are equal, entitled to equal concern and respect. Students have all been told as much since grade school. And most teens are able to follow this out to at least a fleeting thought that overseas deaths are every bit as tragic as those close at home (which is why Singer is able to so readily elicit classroom consensus that distance and nationality make no moral difference). But the typical young person then looks around, notices that neither their peers nor the grown ups they know show any concern for this point. All around them is the general Jeffersonian agreement that "all are created equal," combined with near-total negligence when it comes to living that truth. As these teens are almost always still dependent on their parents by the time their minds mature enough to draw logical moral inferences, they confront, consciously or unconsciously, a cognitive dissonance between the equality principle and the benefit they derive from the fact that their own parents ignore that principle (i.e., their parents regard the care of their own children as much more important than caring for the youth of urban slums throughout the Third World). The revelation, then, is not the idea of equality. The revelation is that there actually are grown ups who take it seriously. Some at-least-moderately clear-thinking adult has stood in front of them and stated out loud a moral inference which, in their experience up to that point, is as universally avoided as it is undeniable. That's the revelation. It's suddenly clear that their own dim and buried realization of that moral truth is not, after all, crazy. Occasionally, such a student will re-orient her or his life because of such a 15-minute discussion in a philosophy class. One such student was Jason Trigg. 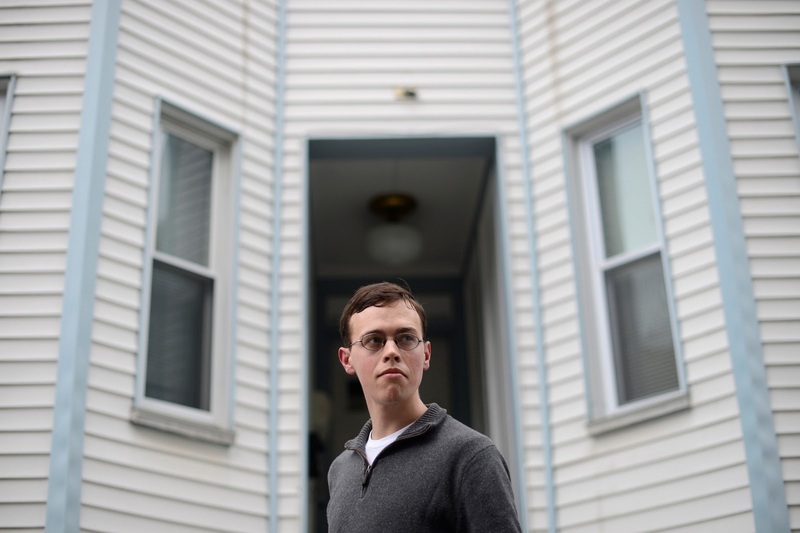 Jason was the subject of a wonderful piece in the Washington Post a few days ago. Impressed by the inescapable inference which most of us know but in forgetfulness of which live -- and of which Singer so boldly confronts us -- Trigg set out to save as many lives as he can. The way to do that, he calculated, is to make a lot of money and give it away. "Jason Trigg went into finance because he is after money — as much as he can earn. David Brooks, writing in the New York Times, suggests the missionary approach would be preferable. Better to go dig the wells yourself than to pay others to do so. Why? Apparently because the Wall Street life is liable to corrupt you. Brooks is certainly right that we become what we do. It's not clear, however, that financier-who-gives-away-half-his-wealth is not a sustainable identity. Is that not indeed the identity that Trigg is reinforcing with every week at the office and every consequent fat check he puts in the mail? There is no "gap between [Trigg's] daily conduct and [his] core commitment" if, from the beginning, his daily conduct is in the service of -- is the manifestation of -- his core commitment (as, in Trigg's case, it appears to be). On what else would Trigg spend his money? A large house? A fleet of Italian sports cars? Why should we think that what he spends it on must somehow compete with how he earns it? If Trigg's wealth went into a large house, we wouldn't worry that over time he would become more hedge fund, less mansion. If his wealth went into sports cars, we wouldn't worry that over time he would become more hedge fund, less Ferrari. Such worries would be silly. Isn't it equally silly to worry that Trigg will become "more hedge fund, less malaria"? Perhaps it's not the work itself that is corrupting but the company Trigg keeps. He'll "become more like the people around" him. But Lake Chalice is not sure that applies to what he does with the money. Trigg's coworkers' attitudes will surely reinforce the core value that making bucketloads of cash is a wonderful thing. But his coworkers will have different projects for the spending of it. Some will want a yacht. Some will want the earliest possible retirement. Some will want trophy lovers. Some, perhaps, will want to reinvest all earnings until they have a enough to conquer the world. Lake Chalice's guess is that Wall Street culture is pretty flexible about leaving plans for the spending up to individual taste while holding adamant to the proposition that nothing could possibly be better than acquiring. We could be wrong about that, but the honored place of wealthy philanthropists among the monied class suggests that giving it away is acceptable within Wall Street culture. "Second, I would be wary of inverting the natural order of affections. If you see the world on a strictly intellectual level, then a child in Pakistan or Zambia is just as valuable as your own child. But not many people actually think this way. Not many people value abstract life perceived as a statistic as much as the actual child being fed, hugged, nurtured and played with." True enough. Not many. But a few -- and Trigg, it seems, may be one. To say that not many actually think this way is only to say that not many people are able to do what Singer shows us morality requires. It is not to claim, let alone argue, that morality does not require it. OK, most don't. But should we all? "If you choose a profession that doesn’t arouse your everyday passion for the sake of serving instead some abstract faraway good, you might end up as a person who values the far over the near. You might become one of those people who loves humanity in general but not the particular humans immediately around. You might end up enlarging the faculties we use to perceive the far — rationality — and eclipsing the faculties we use to interact with those closest around — affection, the capacity for vulnerability and dependence. Instead of seeing yourself as one person deeply embedded in a particular community, you may end up coolly looking across humanity as a detached god." "When most people pick a vocation, they don’t only want one that will be externally useful. They want one that they will enjoy, and that will make them a better person. They want to find that place, as the novelist Frederick Buechner put it, 'where your deep gladness and the world’s deep hunger meet.'" It's a fair enough point that one might end up valuing the far over the near, etc. Might. That's true for any of us. Also, might not. But, yes, it's worth keeping an eye on. Lake Chalice hopes that young Mr. Trigg's passions are, in fact, aroused by the challenges of the job and the prospect of making money to fight malaria. We hope that he finds his work fun and enjoyable. If it's possible for someone to enjoy being a hedge fund manager for the sake of buying vast tracts of real estate, then it would seem possible to enjoy being a hedge fund manager for the sake of buying vast flasks of malaria medicine. It is, of course, always a good idea to check in with oneself and ask whether one is sufficiently loving to the particular humans immediately around as well as to those far away. Trigg would appear to be in no greater danger of emotional detachment from friends and family than anyone else. It's a good question for all of us. From the briefest of glimpses afforded into Jason Trigg's life by Dylan Matthews' article in the Washington Post, we have no basis for supposing that the job he's in isn't the place where his "deep gladness and the world's deep hunger meet." As an MIT computer science graduate, it may well be that he enjoys solving the sorts of puzzles involved in writing "software that turns a lot of money into even more money." That said, at the end of the day, we actually have considerable sympathy for Brooks' point. Our souls do require work that is intrinsically rewarding rather than merely extrinsically. "Taking a job just to make money is probably going to be corrosive, even if you use the money for charity rather than sports cars." Yes, it probably is. We notice, however, that this objection applies to anyone working on Wall Street. To work in the financial sector is precisely to work "just" to make money -- that's why they call it "the financial sector." Money is the only product of that industry, and if we encourage people to choose work that is valuable for its own sake, then we must always discourage them from Wall Street jobs, since money is the one thing that, by its nature, cannot be valuable for its own sake. Its value necessarily lies only in what can be done with it. If Jason Trigg shouldn't be on Wall Street, no one should. And if the making of money the Wall Street way can ennoble any soul -- because said soul holds a sincere and undeluded belief in the good that money can do -- then Jason Trigg's soul is eligible.